I am proud and excited to announce that I am now the owner of an ice cream maker. No longer do I have to look longingly at all the ice cream, sorbet, and frozen yogurt recipes I see. No more will I read about them and think, well, some day. Having an ice cream maker during the heat of the summer is turning out to be a terrific thing, but I suspect I’ll be using it regularly throughout the whole year. I chose the Cuisinart model, just like the one Ina uses, because it’s small enough that I should be able to find a place to store it in my tiny kitchen. I’ve been using it almost constantly since I got it, but if I ever need to store it, I’m sure I’ll find a place. For my first use of the new machine, I followed Michel Roux’s recipe which includes one batch of creme anglaise and then some added cream. Six egg yolks were involved, and at the end of the churning time, I added some fresh cherries. It was a rich, creamy, and decadent cherry-vanilla ice cream. That was a great test run, and next, I decided to try the vanilla gelato found in Demolition Desserts . In the book, Elizabeth Falkner explains that she prefers a pronounced salt flavor in her vanilla gelato. So after the custard base is chilled, salt is added until you can taste it. To begin the custard, two egg yolks were whisked with cornstarch. In a saucepan, milk, sugar, corn syrup, and seeds from one half of a vanilla bean were heated just to a boil and then used to temper the eggs. The mixture was returned to the saucepan and heated for a few minutes. This custard base was then chilled in a measuring pitcher set in a bowl of ice water. Once cool, a cup of cream was added along with salt to taste. After the finished mixture was chilled in the refrigerator for an hour, it was churned into gelato. As soon as I got the ice cream maker home, I started thinking about what kind of cookies to use for ice cream sandwiches. I considered going with a big, thin chocolate chip cookie or maybe a chewy molasses number. I’ll get to those options in time, but for my first ever homemade ice cream sandwiches, I finally decided on the chocolate malt cookies from Martha Stewart's Cookies . 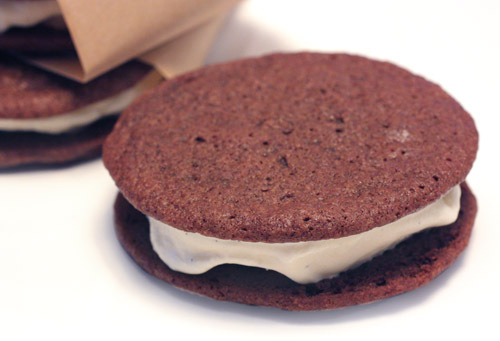 They are intended as a sandwich cookie in the book, I just replaced the chocolate malt filling with vanilla gelato. 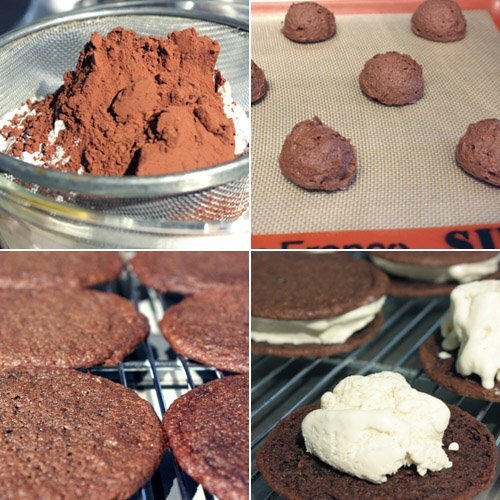 The cookies themselves are made with cocoa powder, malted milk powder, vanilla, and creme fraiche. They have a great texture which is a little crunchy on the edges and slightly chewy in the center, and they worked really well in ice cream sandwiches. The interesting thing about assembling the sandwiches is that the ice cream needs to be soft enough to spread on the cookies, but you need to finish putting them together before the ice cream melts. This was tricky. I let the gelato soften in the refrigerator for about 30 minutes, and then, as I finished each sandwich, I popped it directly into the freezer. I felt a little bad that I wasn’t able to make the sandwiches more gorgeous given the speed required to finish them in my warmish kitchen. They may not have looked perfect, but they tasted incredible with the hint of salt flavor in the gelato and the rich chocolate maltedness of the cookies. Not too bad for a first try. Stay tuned for more ice cream treats to appear here in the coming days and weeks. I'm submitting this to the ice cream social hosted by ScottySnacks, Savorthethyme, and Tangled Noodle. I have the same ice cream maker and you are going to have a lot of fun. The cookies and gelato look fantastic and the perfect treat for this holiday! you could blindfold me - let me taste one and I would be able to tell you that these are beautifully delicious! This looks like a lovely way to break it out and enjoy it! Lucky!!!! I sooo want an ice cream maker. You made those gelato sammies at just the right time. Lisa, these look fantastic! You persuaded me to buy an ice cream maker. Your gelato looks great! I've been wanting a ice cream maker since soo long!! Lucky you! You're really putting it to great use! Congrats on your purchase. It looks like you jumped right in to make an awesome dessert. Lisa, this is absolutely delicious. Love homemade gelato! Congratulations on your new machine. I have the same one, and I always keep it in the freezer in case the urge to make ice cream strikes. This sandwich combination sounds delicious. Congratulations on your new toy! 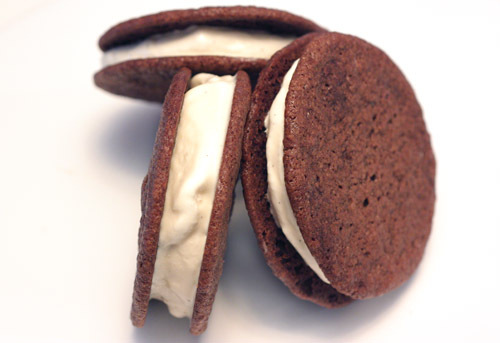 ;) I've certainly been having fun with mine, but I haven't made ice cream sandwiches yet and these look yum-me! this takes the cake! WHat an excellent idea to sandwich gelato! Wow sandwich galeto sounds delicious! what more can i ask? Oh these look great Lisa. Congrats on your new ice-cream machine. Love what u churned out! YUM!! Congratulations on you new ice cream maker and the timing is perfect indeed, I could need a cool refreshing delish on this hot summer days. Gotta get one of this, your ice cream cookies are the only vote I need why I shouldn't think twice to get my own ice cream maker too. Signature: Looking for premium natural vanilla beans at a bargain? Drop by at www.myvanillashop.com for best value. 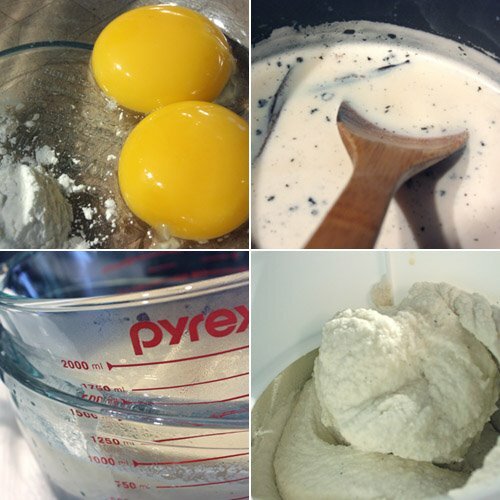 Welcome to the wonderful world of homemade ice cream! I feel as if I'm a newbie, too, since my machine finally saw light for the first time in about 6 years! These sandwiches look fantastic - the c cookies sound perfect for this, resulting in a treat like a flattened-out, frozen Whopper malted milkballs! Oh, My! This looks and sounds so good! Surely is delicious! Delicious ice cream cookie sandwiches! I really need an ice cream maker too! Classic! They look so perfect. You're going to have a great summer making cold treats. These are divine little treats! They look perfect from here! wow I love these cookies....they are super duper yum...I can almost taste it! I could probably eat 10 of these w/o any hesitation. Congrats on the ice cream maker, I love mine. We try to use it all the time. "No longer do I have to look longingly at all the ice cream, sorbet, and frozen yogurt recipes I see"
is definitely true. However it comes at the cost of now having to stare homemade ice cream that you know is ridiculously good in the face every time you open the freezer. I hope you have more will power (or time to work out) than I do! Yay for getting an ice cream maker! Your little sandwiches look super yummy and addicting! those fillings look so awesomely fantastic, so purely white! These look and sound great!!! I got an ice cream maker for our wedding...4 years ago and haven't opened the box...this gelato is making me feel pretty bad about that! An ice cream maker is a great addition to any kitchen. I love mine. Now THAT Is my kind of snack! LOVE it! Gelato! Chocolate malt cookies! Besides me, I know my father would flip for these - I am going home to visit them this weekend... looks like I'll have to whip these up!